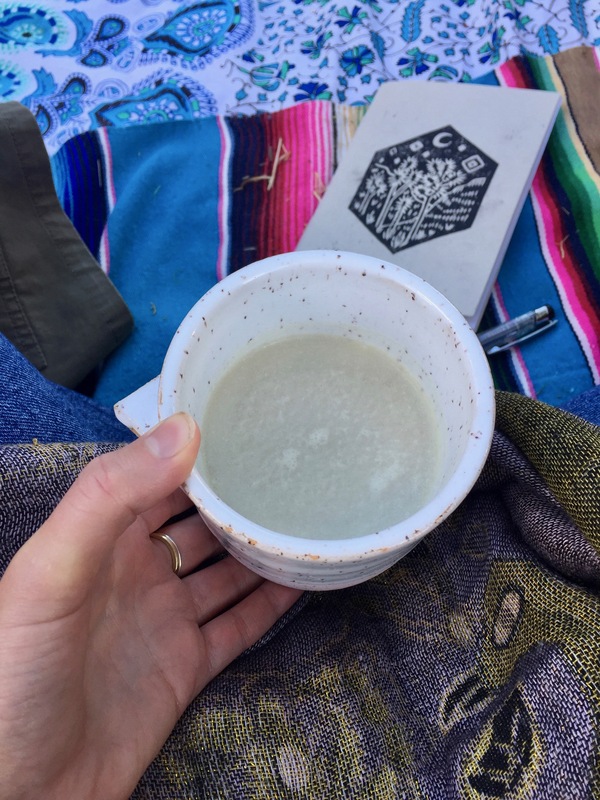 After a quick stop over at the Moon Juice booth for a moon-dusted matcha latte, Sarah and I head over to the big barn where the sound bath is scheduled to take place. For those of you unfamiliar, a sound bath is a form of meditation that is very much what it sounds like-- a bath of sound-- with sounds washing over you as you lie on the floor with your eyes closed. These sounds often include the use of gongs, bowls, chimes, and other instruments. Once we enter, we sit on large fluffy pillows atop colorful rugs and wait for the rest of the people to arrive. 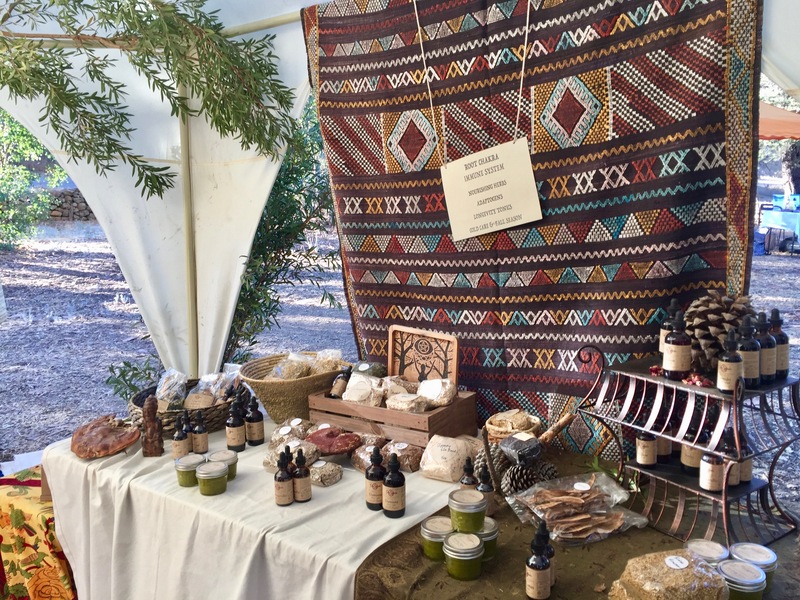 One of our instructors suggests we take a few drop of her Mugwort tincture, passing it around, to which we were at first skeptical but eventually fully embraced as part of the ceremony. Once it began, we closed our eyes and took in the tribal sounds. I'm no stranger to sound baths, but this one was by far the most "trippy" I had ever encountered. I envisioned a large snake wrapping around my body and was confronted by a number of jungle animals. Perhaps, this was the effect of the Mugwort. After an hour or so, we were drawn out of our meditation and given complimentary lavendar chocolate by Honeymamas (so delicious!). Moon-dusted lattes, chocolate and a vivid meditation all before 11a.m.-- we were definitely off to a good start. 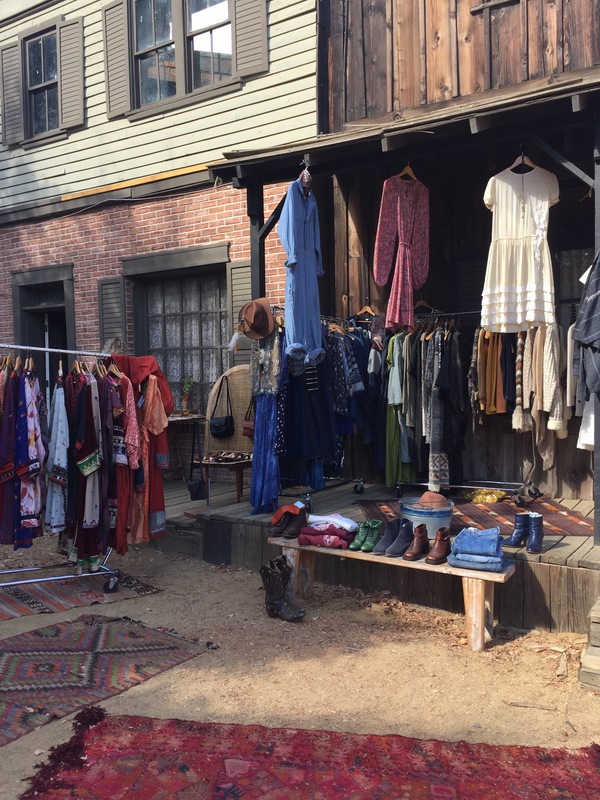 By the time we collected ourselves, we walked around the marketplace, flipping through the countless racks of swoon-worthy vintage clothing, special hand-dyed garments, and ceramic pieces. 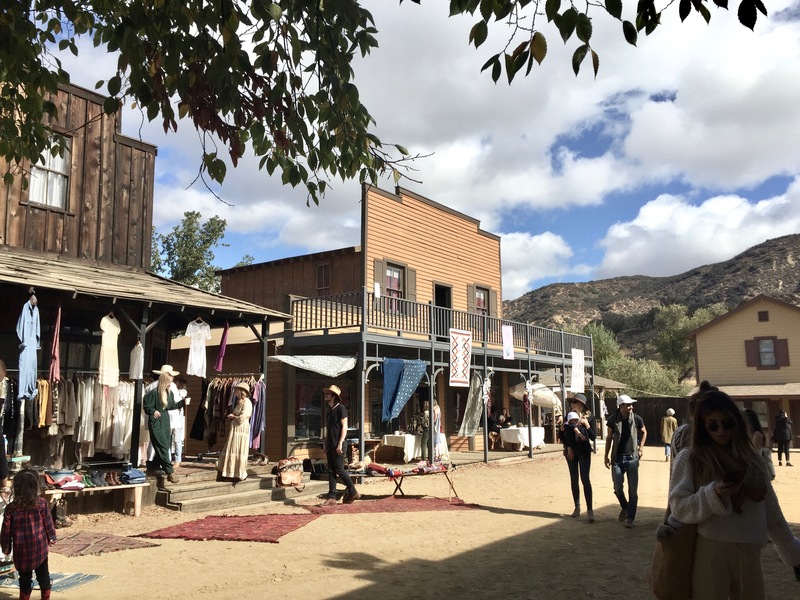 Did I mention, this event took place at Paramount Ranch, the Western-themed set where many movies and shows were filmed including Westworld? 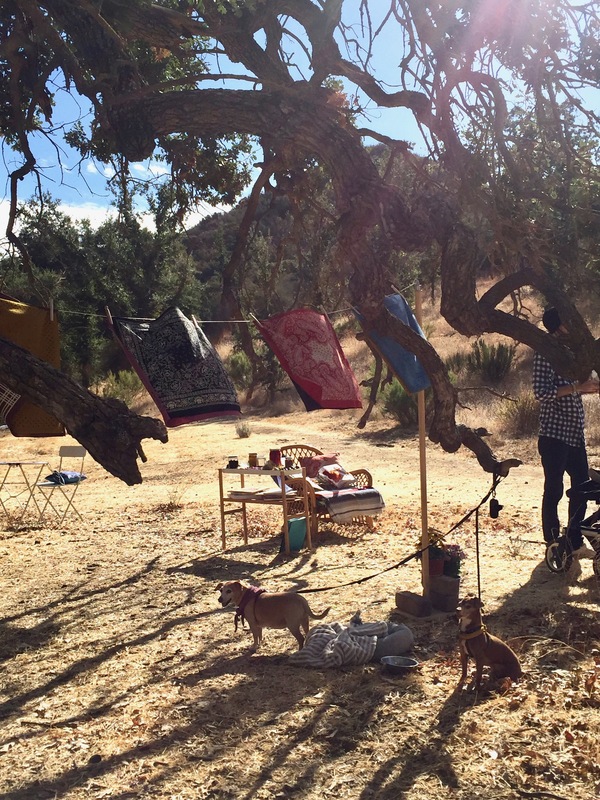 Some of my favorites were Tavin Boutique, Osea Malibu, and Gaia School of Healing. With so many interesting talks all happening at the same time, it was hard to choose which ones to attend. Other talks going on were "Animal Communication + Energy Healing," "Elemental Alchemy: Biohacking Your Water, Air, Earth + Light," and "How The Indigo Crystal + Rainbow Children Are Here to Change The World," but because Sarah is interested in people transforming their careers, we went to hear Jamie Brisick, a professional surfer, photographer, filmmaker and published author, who spoke about his life in surfing and transition into writing. He pursued a life of following his passion, regardless of money, and it was inspiring to hear him talking about living a life doing what he loved most. I mean, have I ever been one to say no to an aura photograph? I began by entering a large white dome, where I sat down and placed my hands on two metal censors. How it works is that the censors pick up on energy from your hands and your aura is printed out like a polaroid. Once my photograph came out, I was given a reading based on the colors in my photograph. Mine was a mix of reds, orange, pink, and violet. Red signals leadership and manifesting power, while orange correlates to creativity. Pink, she said, meant I was holding space for love and friendship and that a circle of violet around my throat chakra meant I was finally speaking my truth. 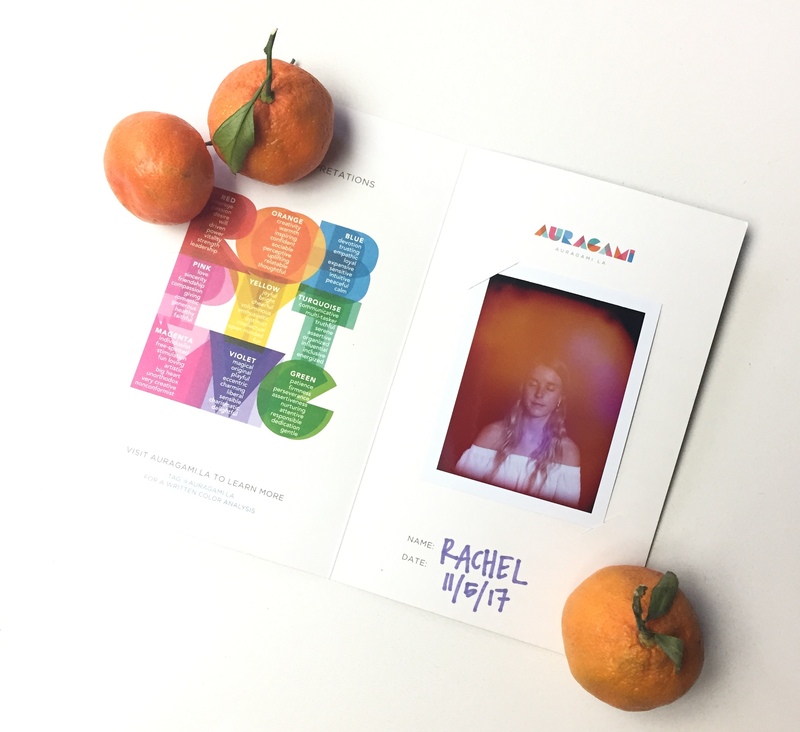 I wasn't really expecting much (especially since I just had my aura photographed a few weeks ago in Sedona), but to my surprise I really enjoyed my experience and was actually a bit speechless that the camera (and the aura reader) picked up on several things I'd been privately feeling and working on with myself. With so many amazing lunch options from places like Imlak'esh Organics, Wholesam, and Tacos Punta Cabras, we settled on a place called Dark Horse, headed by plant-based chef Greg Arnold. 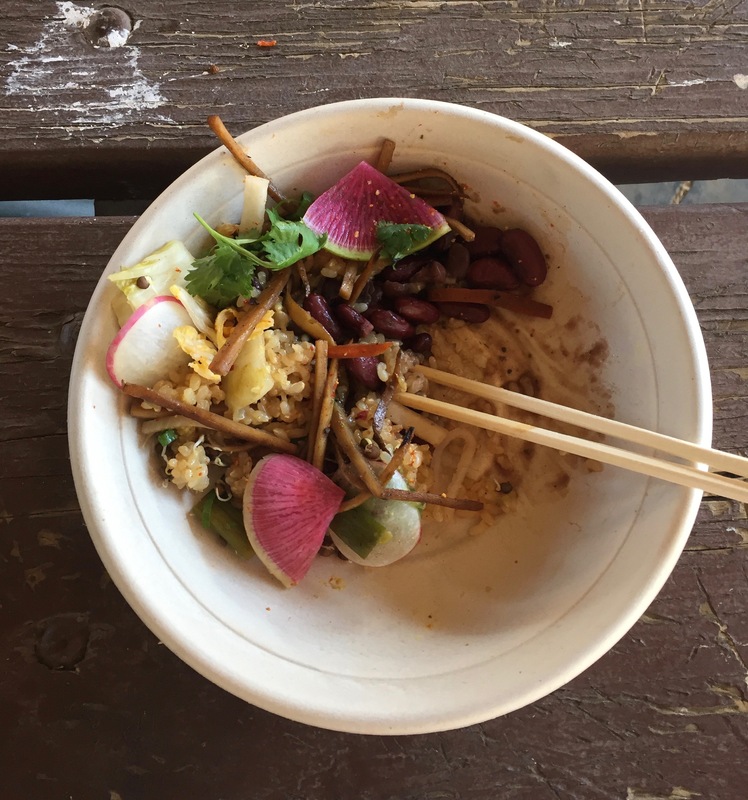 Turns out Chef Arnold is known for opening the hottest plant-based restaurants in Southern California including Sage, Matthew Kinney's Plant Food and Wine, and most recently, Santa Barbara's Mesa Verde. Sarah and I both got the forbidden rice dish, which was so delicious I forgot to photograph it until it was already half-eaten. Always a sign of a good meal, eh? 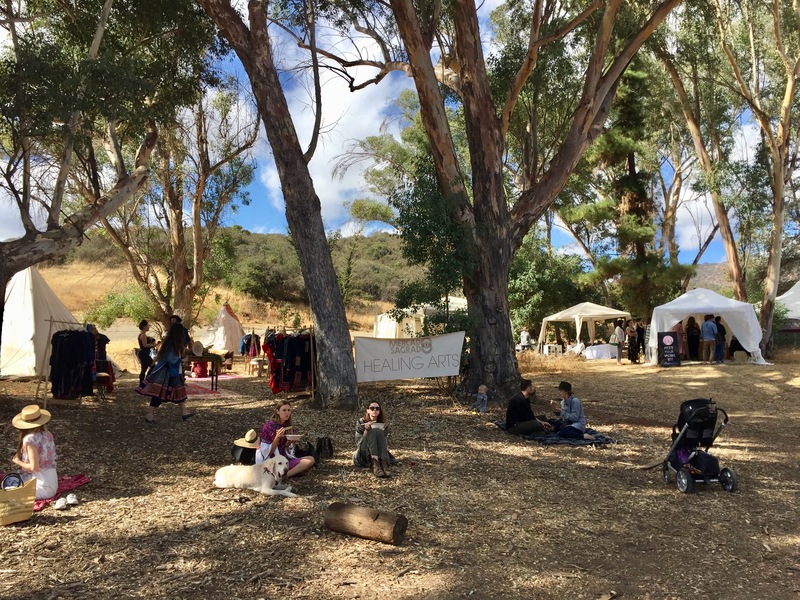 Perhaps one of the more exciting events of the day, we also signed up for a special Kava Ceremony led by Marisa Miernowska, the director of the Gaia School of Healing and Earth Education. About thirty of us sat in a large circle surrounding a centerpiece made of tree branches and four jugs of white liquid. Here we were introduced to Kava, a medicinal plant which comes from the South Pacific, traditionally used as a social beverage in ceremony and recently used in the U.S. to treat stress and anxiety. 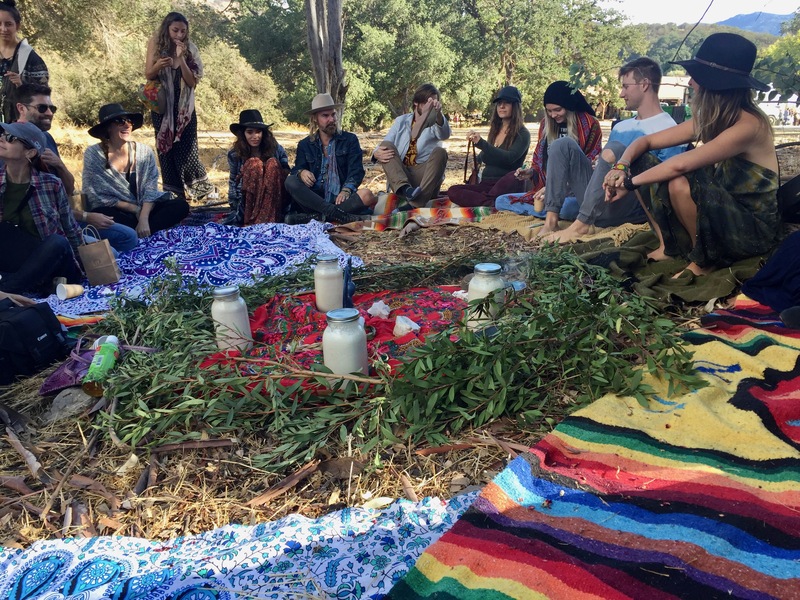 We learned about the spirit of the plant, its uses, and were guided through an hour-long meditation to meet the spirit and receive its medicine. While sipping the Kava poured in our mugs, we were encouraged to also journal any thoughts or feelings we experienced. I have to admit this was my favorite activity of the day. I hadn't sat in a large circle outside since my school days. There is something very special about sitting in a circle of people, enjoying and experiencing the same thing together as a community. The Kava made me feel earthy and grounded. My whole body and mind felt quiet and still. It was a very spiritual experience. It was a feeling of thoughts quieting, yet my body expanding into a space of stillness. I left with a new reverence for the power of plants and both Sarah and I were so mystified by what we felt that we both picked up a bag of Kava at the Gaia booth to take home with us. Afterwards, Sarah had an acupuncture appointment while I decided to peruse a few more shops before going home. Leaving this magical place was perhaps the hardest part of the day. There was so much to see, to touch, and so much left to be explored. I suppose that is why some people go both days. Until next year, Mercado!